Being a minimalist with a large family (8 of us! ), the question is often asked how that is possible. Honestly, when I look at my home, it doesn't feel "minimalist", but each person's view of minimalism is different, and it should be different. We all have different lives and different priorities. For our family, one of my biggest priority is to serve real food. So I have tools in the kitchen that help me achieve that and make my life easier. On the sink: Foam Soap Dispenser, and I use this dish soap. I love these strainers in the sink. Dishcloths for handwashing and cleaning. Under the sink, I have this dishwasher detergent, garbage bags, and rubber gloves. Hanging on the stove I always keep a hand towel, we use them for hand drying, dish drying and cleaning up spills. One the fridge, I have my Yearly Decluttering Challenge Checklist and my current month Decluttering Chart. Open shelves make me happy! My husband made these for me and I love the natural look. Below: is my "prep" sink, which is what it was meant as, but instead, we use it for our drink station. On my shelves: 8 dinner plates, 8 salad plates, 8 soup bowls, 9 water glasses, and 2 scotch glasses. Above the fridge, I have an old fruit crate screwed to the wall for a shelf, in it. This is fabulous! Thank you for the specifics. I didn’t see a crock pot or a food processor, I guess you just use the stock pot and knives? 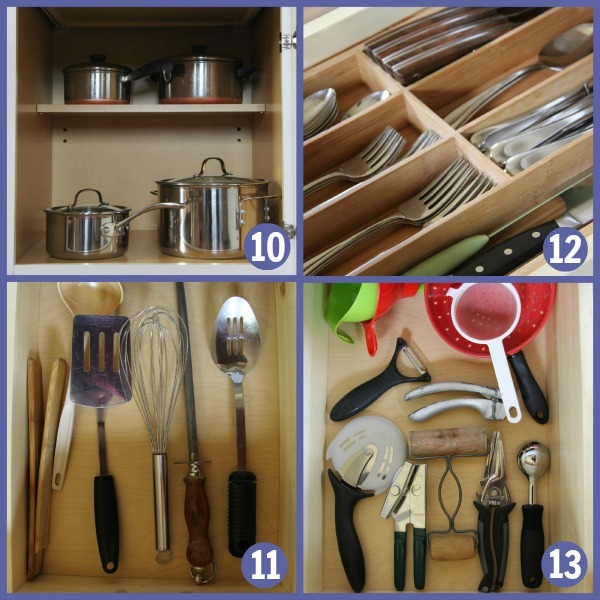 Your utensil drawers are beautifully arranged; what keeps them that way? Thanks again! I use the immersion blender to make mayonnaise. Fast, simple and easy cleanup. In a clean jar (I use a 16 oz peanut butter jar) add 1 egg (whole), 1 cup of oil, juice of one lemon, salt, pepper, 1 tsp of mustard. Immerse the blender and move it up and down until emulsified. Add oil as needed. That’s awesome! I think I need a stronger immersion blender- but I’ll give it a try. Thanks! Hi! I was just wondering, with that many children, how do you find time to do things like make mayonnaise? I only have a 4 year old but he keeps me so busy that meals are much Less wholesome than i would like! I totally relate to this question-my 4 year old Wants My conStant attention! How Do you do it with 8?! How do you get quiet time when you have littles & when does it get better? As a mom of 4, I would say that your 4 year olds keep you busy and need your constant attention because you give it to them. I give attention to my kids at times but I also do my own thing and give them the opportunity to do their own thing. I realize this is easier per say because they can play with each other BUT they also fight a lot so I am dealing with negotiations all day long. I hate to say this because it sounds harsh, but ignore your kids. Tell them to go away and find something to do. Get your stuff done so that you can be a better parent for them when they actually need you. Because they don’t need you all day long! They can find ways to entertain themselves it just takes practice. The more time you give them to yourself the more they will be able to help themselves. Yes. Good but challanging to do. Ladies, I hope you don’t mind of I share a different perspective. The rest of the time we did lots together. In my office he had hos own mini desk and we both “worked” for example. I actual work, he drawing, clay, legos, etc. And organization tricks like plans, schefules, freezer meals, checklists. But organization was my sanity only if I wasn’t a slave to it. I solved this by creating flexible schedules with many activities. So if one schecile didn’t fit one day i switched to another one or modified it. But “Me time” was always in it for both. (Nap times are great for this.) And so were silent times through the day. Just taight him we all have silent times every so often. Also we did a lot together. He helped with everything or kept me company, had his book, legos or drawings to keep him busy but with me. My schedules were balanced at least half his activities half mine. So my house wasn’t perfectly nor did I do everything I hoped to, but I priorotized being a mom. Still I got surprisingly much done snd he would refer to the schedule himself. Real food and a lot of non-toxic DIY are very high on my priority list, so i make mayo and soap etc. But crock pots are my best friends, as are simple one pan meals. Meal planning, and checklists. No I never follow them to a T, but they are a great guideline, an aide. Mayonnaise takes about 2 mins to make. You need to set some boundaries with your 4 year old. They don’t need your constant attention, they need to learn to spend time playing or amusing themselves. Or start them helping in the kitchen. I would get the kids to measure things or get out a pot or measuring cups, not only does it keep them occupied, but they start to learn a love of cooking. Thank you, a great reminder for myself and 3 year old. Life lessons for sure. I’m sorry you are having to go through the cancer journey:( Thanks for your words and insight! I am new to the lifestyle. Thank you so much for sharing your home. 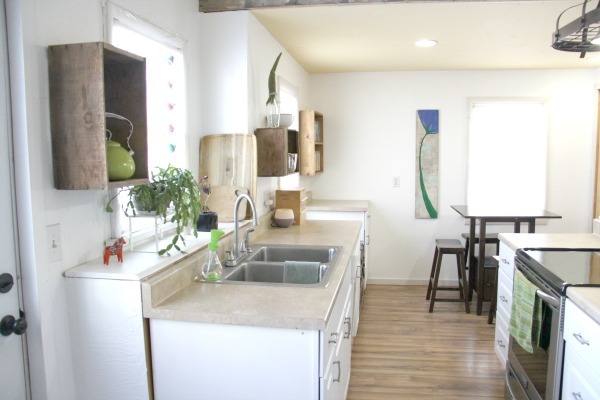 In a moment, I am going to give away half of my kitchen! I love your pine shelves!! Those open shelves are lovely. Do you have only 1 plate per person? This is revolutionary. My mother did this after she sold the house and her enormous collection of vintage Jadeite that we never used anyway. Everyone had one set: Big plate, little plate, bowl, cup, and flatware. They all looked different. If you wanted to eat, you’d better make sure your dishes were clean. Could you post the links to the plates you use again? unfortunately the links don’t work and we are very interested in getting a quality set for our family. Thanks! My family did this this summer as a challenge when I decided to stop doing everyone else’s dishes. There are 3 of us (but my guys seem to use one plate for this, one for that etc.). So we each chose our favorite plate, bowl, glass and mug. My son asked me yesterday if we could continue after school starts. Yay success! Im just starting to simply. Glad to find your blog!! Awesome! Thanks for being here! Nice with two sinks. It might not be so “minimalist” for some but it is so practical. I’d so the same if I could since ours is so small. Pie plate ? Muffin pan ? Baking equipment ? The effort of decluttering and only have what you need and/or currently use is a great idea especially if you have time from a demanding full time office job and raising kids at the same time. A supporting partner is also crucial. Also, should keep in mind that different folks are likely to have different basic needs. For example, I would forego my pots and pans before having a kitchen without my wok which could be used as both! And no, ice cream maker is not important to my family. If you dont use shelves – what do you use? The effort of decluttering can be done by anyone if you make it a priority. You have made excuses (kids, jobs, etc). It is easy to make excuses in life – we all do regularly. But if decluttering and having a simple home is a priority for your family then you will find the time. Also the other made clear that the items in her kitchen were her choices and that others choices will be different. You don’t need to reiterate that point, you just needed to read the article. I personally love open shelving as I find I have to clean it less! Because we have less items we use them all the time and as such nothing builds up dust. We are moving the items around on the shelves, taking them on and off. I save the time of opening drawers. Same here! I use just one wok to make steak, pan cake, sunny side up eggs, pasta, sauteed vegetables, fried rice & everything! Have another pot that came with the rice cooker, which I use to make soup sometimes. I live with my boyfriend, and a wok and a pot are enough for two. Sorry but don’t think I would pay for advice on minimalism from some one who regards a pizza cutter, ice cream scoop, ice cream maker and a special knife for tomatoes as essential !!! I strive to cook real food for my family Elly, so I cook a lot and I keep what I use regularly and what makes my life easiest. I know I don’t “need” an ice cream maker, but if I want to enjoy healthy ice cream with my children, it helps to have an ice cream maker. Balance. Minimalism is going to look different for different people, for me, it’s about paring it down to what I use and being content with that. I agree that minimalism for a family is totally different than the 100 personal item minimalism that appeals to singles. I live overseas and we eat almost 99 percent of our meals and home and host guests regularly. I would like to get rid of more, but I simply can’t ask a person who has just come off an international flight to “bring his own dish” nor can all meals be served on disposable. So my kitchen has more than yours although I am always looknig for ways to pare down but I simply use the kitchen so often and the gadgets that are used at least weekly STAY. For me that’s waffle iron (every Saturday morning), crockpot, Kitchen aide, blenders, and yes even a few more…because they are well used, loved, and make my life better in the kitchen. Don’t feel bad about an ice cream maker! Awesome reply. I love how positive it was in spite of the negativity of the original comment. And I would definitely pay you for the balanced approach you take. Awesome reply Rachel. I agree, everyone has their way of living simply. It’s been my experience that if you don’t have something nice to say, don’t say anything at all. Keep it up Rachel, love the blog! You are an absolute minimalist without question. You have the minimal amount of stuff you need to sustain an enjoyable lifestyle for your family. I bow to you! Elly, her advise is personalize and it would be such to you. 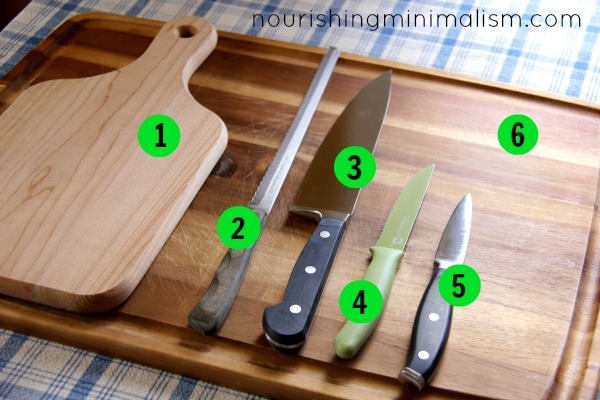 I use a tomato knife for most veggies, its a great multy purpose knife and so small. Also note no space hog, radiation emitting, molecular structure changing microwave. Fantastic trade off! The extensive research on microwaves has deemed them to be safe. In order to believe they are not safe for humans to use for food, you would have to refute 30 years of research from multiple research institutions and hundreds of peer reviewed scientific studies from around the world. I don’t know about you, but I use the science and evidence-based information to make decisions. Not having a microwave is entirely personal – for a variety of reasons – but making a comment such as “radiation emitting molecular structure changing microwave” clearly meant as derogatory doesn’t help your credibility. You’re entitled not to own a microwave because you believe they are not safe, but the science won’t back you up on your belief. I do know people who don’t want them because they take up space or they simply stopped using them for whatever reason. Hey Laura, late to the party though I am, I’d love to see links to the research you have referred to. I’ve been looking for research like this for years and haven’t been able to find anything conclusive from independent sources. Beautiful! You kitchen is inspiring! I am wondering if you use the pot and pan rack over the island? I printed out and posted your 2015 in 2015 chart and posted it in our kitchen to get us started. Wish me luck! I come from a clan of packrats pilers and have been trying to declutter and live more simply for 20 years! Wish me luck on this journey! Thanks for sharing yours! And I don’t use the pot and pan rack- I liked the style of the light, but when I hung the pots and pans on it, I felt like it cluttered the view too much and I had room for the pots and pans in the cupboard, so it worked out. Thanks for detailing the kitchen necessities. It is so helpful! Can’t wait to explore the rest of your site to see if you detail other rooms as well. Happy New Year! room for things and food. I need to purge BIG time. However my storage and food are all in my kitchen and so that is an extra challenge!! I super love your site and the inspiration it brings!! Since I cook with more “real food” now, it takes up a lot less pantry space (and a lot more fridge space!) but when we eat boxed food (and particularly cold cereals), I needed a lot more pantry space. Thank you! We eat mostly real food too. Someday I’ll live in a house with a pantry! Until then I’ll declutter and be better for it. With prayer, it will get better! This is inspiring. I cook all real food too and as a food nerd i have too many gadgets. Do your kids like to cook? mine do although young and so i have duplicates of many items such as peelers so everyone who wants to help can. I want to write down a list of everything i need for my kitchen activities and then see what i have that isn’t on the list. It will surely be eye opening! i love open shelves but also can’t deal with the dust. For me glass doors are ideal for my future fantasy kitchen. I’m so happy I came across your blog. Beautiful! And can I move in please??? Hello, I am so happy to have found your website. You are inspiring. My husband and I agreed that before we look for a larger house we would spend a year decluttering. Your list was the answer to my question, “how?’ I emailed in for the 2015 in 2015 schedule and received it. However, my husband accidently deleted the email. Is there any way to get it again ? Thanks so much. this is so helpful–thank you. the kitchen is the most difficult for me so it’s helpful to see the itemized lists with pictures! Your kitchen is very lovely. Being minimalist is really about just having what you really need, not so much about how much of anything. You have the right idea of what it is to be a minimalist. For the last few years, my husband and I have slowly downsized to fewer things and it always feels good to get rid of things that we no longer need or want. I enjoy your website, Rachel. i have always disliked clutter, I have been a Minimalist for many years, but I did not know there was many people like me. I thought I was Different! Now I know I am not alone. I look forward to reading all your advice. My Girlfriend is just learning about less is Best. It helps to have a partner who also is a Minimalist. I see that someone is a fan of the Pampered chef! I love them 🙂 nice kitchen, it’s definitely going to inspire me to get better organized before my new baby arrives… this week’s project! I see the extra plates for guests, but what about serving a large group of guests? 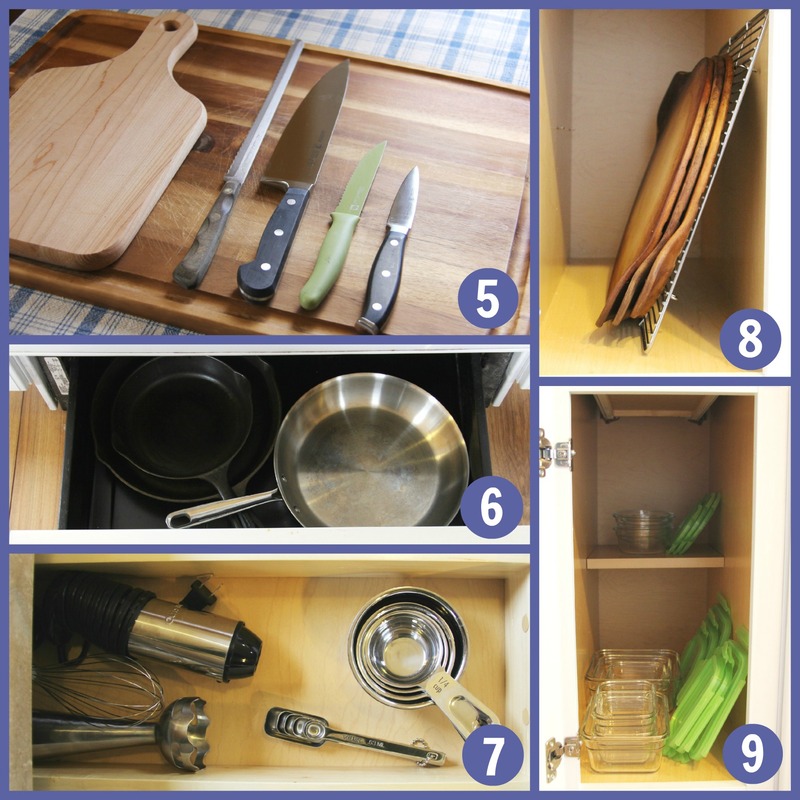 Do you have extra serving utensils/bowls/platters for this? I keep trying to pare down but find it difficult when my household of four can jump to a “small group” of 15 if a couple siblings from my large family show up. Maybe my uniquely large family (and the fact I love to host) means I can’t minimize this much? I love your website! I’m trying to live simply but it’s babysteps right now. I was wondering if you put pictures of your family or painting that the kids made on your walll? I love to have them up as some are just to cute and lovely to be shoved away and rarely ever looked at. I do have a lot of artwork in the livingroom. We have some frames that we put the kids artwork in, and I paint as a hobby, so we have a lot of my paintings up. I don’t have any photographs up right now, but I have in the past. Went to the store today, and had a totally different experience. I wanted bread tins….I got bread tins. And, looked at everything else and said, “I don’t need that….I have that….I don’t know where I would put that!” Left feeling light and happy! Thanks for being transparent! I love your post! I wanted to suggest something for readers to start this process. Get some of those tiny stickers for a teacher sticker chart. Put them in every utensil and then take them off when you use them. After 6mon-year items with stickers pass them on or donate. I used it for my kitchen, and only had a fleeting moment of regret but it passes. This post inspired my entire minimalist journey! And “nourishing minimalism” is my favorite minimalist blog, hands down. 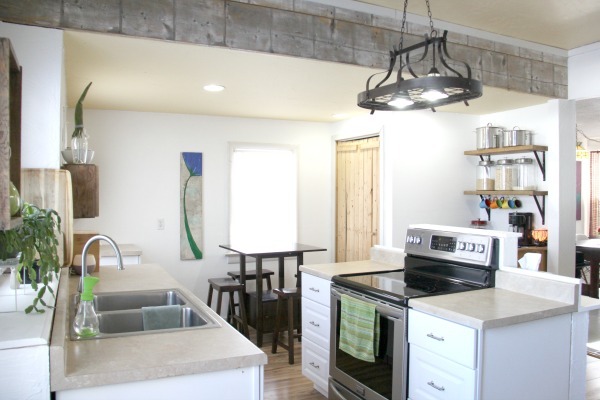 I have one question about your amazing (colors, organization, real food ready) kitchen… why the pot rack over the lights if it doesn’t hang pots/pans etc.? I think I need one to hang my cast iron pieces, but you do not seem to need it. So I’m wondering if it just happened to be blank for the picture. Thanks!!! I ended up decluttering more and not needing a ceiling rack 🙂 Though, in the future, I would not be opposed to one. I’d love to free up the cabinet I have pots and pans in for food as we have no pantry. 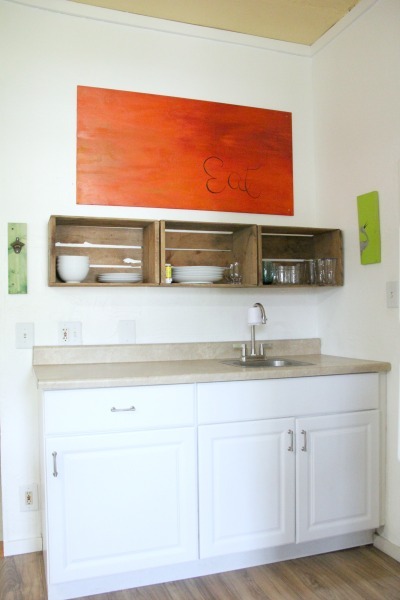 I think I would put the rack over my stove, against the wall, so there isn’t visual clutter, like over an island. Thanks so much for the idea and “warning!” Visual clutter is the worst! That’s great Dagmar! Thanks for joining me here! I love your kitchen! Are the white cupboards hard to keep clean? Thanks for this post! I’ve been working on moving to a simpler set-up in my life. Simplicity and peace are my goals, not perfect minimalism (moderate minimalism, perhaps?). I was looking to make a list of the minimum that I need and I’m glad I came across this article and your blog. While of course, details will differ as what my fiancee and I need to make our lives comfortable will not be the same as a family of 8, but this was helpful and inspirational – if your large family can do it, then so can my small one! Hello Rachel! I have been doing your 2015 challenge and decluttering since January and having stumbled onto your website. The house is really starting to look great! I am wondering about all those cutsie little kids plates and bowls and spoons and cups that you somehow end up having when you have children( I have 4). This is wonderful! Can you do a tour of your home? How do you get your husband and children on board to minimalism? I can minimalizie my stuff, but my husband just not keen on decluttering and minimalizing. Any suggestions? Elle, (sigh) this too is my problem. … i can tinyize all my kitchen needs but my partner is a typical male who thinks bigger & more is better. He has huge metal bowls, huge pressure cookers, huge pots & pans, huge glassware and dishes that his deceased wife & he raised their family with. There’s only the two of us now and all that stuff is unneccessary space hogs in our teeny-tiny kitchen. … and of course youKnowWho gets the thrilling job of trying to clean up all this big stuff with arthritic hands & back. Rachel, You are so right when you say that what is “essential” for one person is not the same as it is for another. We make a lot of pasta here; therefore, we have a pasta spoon. Could we serve pasta with a regular spoon or fork? Sure, but it is so much easier with a pasta spoon that has those spines to grab the noodles. Years ago, a friend of mine with a large family and a tight budget didn’t even know what a pasta spoon was. And, when I told her, she scoffed. To each her own. It only cost me a dollar and is my most-used large untensil! I happily gave up something else – whatever it was, I don’t recall – to have room for that pasta spoon! I just found you site last night and it inspired me to go on a late night cleaning & decluttering spree. (It’s going to be a multi-day task.) I was rearranging our kitchen hutch when I wondered- where does the food go? Have you ever posted pictures of your pantry &/or fridge or do you only keep the minimal cooking supplies shown? I make a lot from scratch so about half of our kitchen is devoted to food storage. I’d like to reorganize it and make it neater though. If you do have such a post I would love to see for some idea inspiration. I am so excited to find your site. I always knew the clutter made me crazy and even when it’s clean it doesn’t feel clean. I need to do this. Thank you! What about spices? Everyone who cooks from scratch needs spice containers, unless you are just purchasing the prepacked commercial variety from the grocery store. We buy all our spices in bulk. Just get the amount we need to keep fresh in storage. No waste. Besides it is weigh less expensive buying spices from bulk. Your kitchen is beautiful! My husband was amazed by your kitchen . We both agree that is what we want for our family. Do you have any advice on purging toys and craft supplies? We have 3 girls 5, 3, and 1. I’m sorry for some reason I got your name mixed up in my head. Hi Rachel! LOVE your site 🙂 My question is this: we have four kiddos and a dog and I can simplify out stuff pretty well, but we OFTEN have company. Lots of cousins, and we host our not-so-small-church-small group (40 people) as well as my daughter’s 6th grade church group (20 kiddos) weekly. How do I deal with the dishes/cups/napkins/food situation? So far we have just relied on paper and plastic 🙁 Any advice for simple living that involves LOTS of entertaining?? I have a bunch of corelle dishes- just the large plates and salad plates. I keep them in a corner cupboard. They are out of the way, but easy to get to, and, since they are Corelle, they don’t take up much space. But they are there for when we have large groups over, or my family (I have 10 siblings and most have a lot of kids). We end up using paper/plastic for cups so we can write names on them and I have a bunch of plastic forks. I will throw plastic silverware in the dishwasher and reuse them, but I don’t worry about losing my actual silverware. Keeping all the “entertaining” dishes in a separate area has helped us avoid piling up too many dishes during the week, when it’s just our family. And when we do have company, I feel like the Corelle dishes are super easy to throw into the dishwasher. If I do it immediately after the meal, most people chip in and it takes very little time. The only serving dish I kept was a couple large platters for fruit/veggies/cookies, etc. Everything else I use what I cook in: stainless steel mixing bowls for serving salads, large pots just get set out, rather than transferring the food to special serving dishes. Thanks for this reply. Today I was wondering if I should get rid of the Corelle pieces I still have in the process of minimalism. Now I know what else to give away instead. The pic of your kitchen is inspiring, but I do have a question concerning the use of crock-pot. If you don’t have one what do you do when you want to cook a big meal w/o having the time to labor over it. For me, crock pot cooking saves so much time. So what method of cooking do you use when you can’t be there to do the cooking? I just don’t want to be over-zealous (especially w/o knowledge) and go get rid of everything. But I will pare down my kitchen. Your practical, step by step instruction & encouragement is GREAT & HELPFUL. If it’s something you use, then keep it. For items that I wasn’t sure about, I stored them in the garage for a year, if I didn’t go retrieve it during that year, I let it go at the end of it. I know people that use them weekly, so for them, it would be good to keep. I tend to do all my cooking in pots, but I work from home, so I am able to monitor things through the day. I have heard of when you box things up for storage, label each box, in pencil, with what is inside. Then you could aLso keep a small notebook, in pencil, with the same list so you don’t have to run out to the garage or storage area every time you are looking for something. When you do decide to get rid of the pieces then you caN erase it off the list. Rachel, Hearing that you have a family of 8 instantly gets my attention. I have one too and am drowning in stuff. We just created a huge kitchen (18×20) with tons of cabinets and it’s still a cluttered mess. Seeing exactly what’s in your drawers is inspiring. I have like 8 spatulas, you have 2. I just asked myself, why 8? Because they’re always dirty….another growth area for me. I’m going to go find a box and fill it with the extra stuff. Oh I love this. How I wish I could declutter the whole home! I married a clutterbug and the house is just unbearable at the moment. I need to seriously do something about it. I think i’ll start with my daughters room. I love how minimal and simplistic your room is. Found your blog through pinterest! i love your minimalist kitchen,i recently moved to Australia and Liam hoping to settle in my house soon with my family,and this is my ideal kitchen.thank you so much. ?! Drop everything!! I… I don’t need to read any further. No, I am not being sarcastic. I was pursuing some of your other pages… I don’t even remember how I stumbled into this blog. I frequently wind up at minimalist inspired blogs, and inevitably wander away again with something that sounds like “great for urban couples with one kid…” or “well, maybe when the children all move out…” rattling around in my head. We are growing family of eight, and I’ve been called “spartan” since my youth – that’s naturally me! But with six other people… sometimes I just want a little encouragement, especially family/mom/homemaker encouragement. But most minimalist support/blogs/etc leave me instead feeling, oddly defensive, of our choices to live semi-rural and have a large-ish family. Anyhow – singing up for the newsletter, then I’m off to make the kids a snack so I can sit down and really dig into this site! I just thought you might appreciate knowing you grabbed a subscriber with that one little line. Family of 8. Rock on mama! Also, Leo Babauta of zenhabits.net has 6 kids also. Okay, on looking back at my post, I should have included a “thumbs-up” much earlier – I can see how you would be braced for something else! Thanks so much for the recommendations. I took a brief look at The Crunchy Muffin and yes, that will definitely be bookmarked and visited! I’ve read Zen Habits off and on for a few years and think Leo Babauta is great. I completely forgot he has a large-ish family! Leo’s writings can be very motivational. I just bought 30 Days to a Clean & Organized Kitchen. Read the intro last night and plan to get cracking tonight. wow, really enjoyed taking a tour of your kitchen. you really have it down to the essentials. i need to weed out my kitchen asap. thanks for the inspiration. Hi. I think your kitchen is so pretty. Much like a dollhouse kitchen. Please don’t find it weird but the reason I was drawn to minimalism was because when I was very young I loved playhouses so so so much and I want to live inside it. And minimalism lets me live that dream. If you search for dollhouse images on Google you will see that everything inside a dollhouse is only necessity. Greetings from Philippines! We just downsized from 2500 square feet to 1500, and I had no idea where to start in getting rid of excess in my kitchen. This detailed tour of your kitchen was SO HELPFUL. 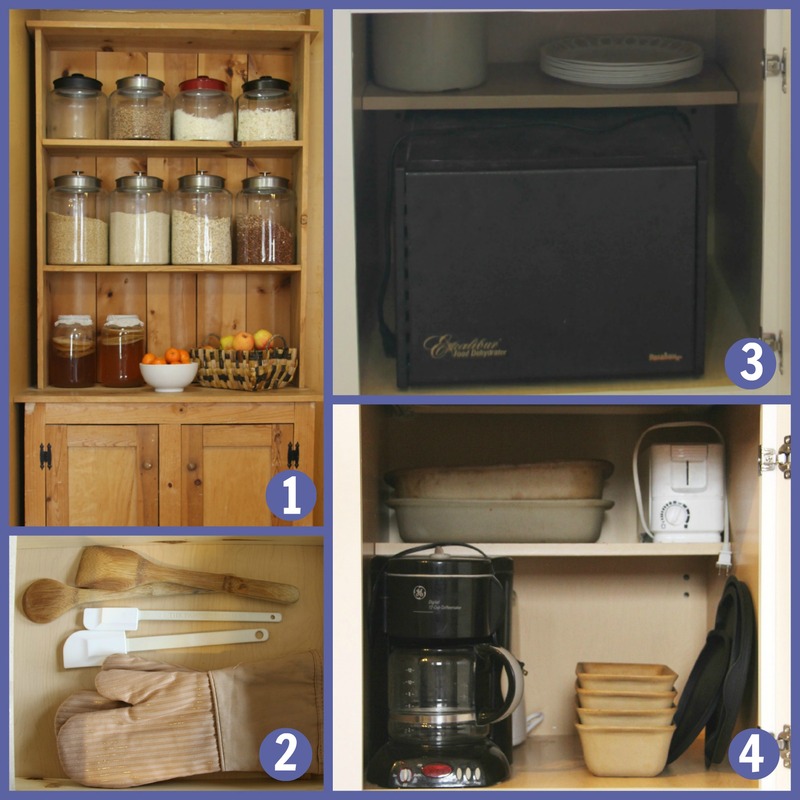 Even though some of my “must-haves” were different from yours (like a slow cooker vs. dehydrator), it was easy to use your kitchen as a template. Thank you for posting this! My husband and I are already loving our clutter-free kitchen! Reading your page this evening has opened my eyes as to why I have been feeling the way I have, and wanting to donate anything, I or my husband doesn’t use. I really enjoyed your page. Look out Dave, I’m getting back to it tomorrow. Thank you. I’m wondering what your typical meals look like throughout the week. I see you only have a few pots and a few pans, which seems doable to me, but then i remind myself how big your family is! so are you cooking a bunch of things for each meal and washing the pots/pans inbetween? or filling up on bread in addition to food? or….??? On average we have eggs, fruit, or cereal for breakfast, leftovers for lunch and then I cook a simple dinner. I try to avoid a lot of bread, but we do have sandwiches for lunch once or twice a week. — SHArp knife, I make pizza and often works very well. Pizza cutters will save you a few seconds, but this to me only feels relevant in a RESTAURANT context where the practices of Henry ford come in handy. — SHARP KNIFe, chop-chop-chop-chop into tiny bits. knives are a dream to clean —garlic presses, not so much. i’m curious about your views on crockery. Lately i have been thinking that one size of duralex provence glasses would suffice for drinking all hot and cold drinks accross the board, perhaps going halfway horse with some wine glasses as well. With as many as 5 people in the kitchen at our house and taking time to sanitize between cutting raw meat and vegetables, no, two knives would not be enough! I love the lack of clutter, and the fact that only what is used is there, but I would add a valance at the windows and a simple picture on the wall of a pleasant nature scene with water in it like a creek or pond. I love seeing dry goods in glass jars, It looks so appetizing. Love your kitchen! What color of paint is the yellow wall? I am wanting to paint our dinning room! Thanks! I know this is an older article but I’m looking at getting those exact and 1.5 and 2.5 gallon jars for my open shelving and I want sure if 2.5 gallon would look huge. Do you mind me asking what you store in yours? I wanted them for my bread maker flour, brown rice, oats and quinoa and I’m trying to avoid having jars but then also having to store what wouldn’t fit in the jars somewhere else. From what I could find these would fit a 10 lb. Bag of flour, would you say that’s right? Yes, they would hold a 10 lb bag of flour. I store rolled oats, white & brown rice, coconut, and lentils. I have a couple empty that I put granola in them when I make it. Dry beans (pinto, etc) didn’t store well in them.